You are sitting at table time, or in a circle, talking to a child in your class about something or another. They are nodding, smiling, or sharing their ideas. You feel great because being a teacher is the most rewarding thing in the world. Then... IT HAPPENS! The child gets this face, all peppery, turns to you, and you think they may ask something important... but no. THEY SNEEZE ON YOU, right in the face! You cringe in fear! You think to your self NO, NOT THIS, ANYTHING BUT THIS! You wonder when you can get to the bathroom to wash your face and hands, but you realize it has gotten on your shirt as well, and you cannot simply leave the classroom, so you go to the sanitizing station, but that is not enough. You know in your heart of hearts, you are going to get sick too! Well, that's how it happened anyway. One week of sickness, and I feel great... lets' see if they do it again! How could I resist not putting a spider on them. It is almost Halloween anyway? Black and Red remind me of blood. 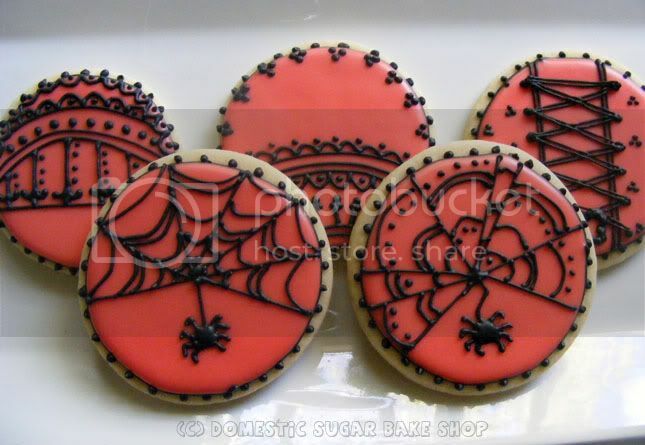 Orange is too pumpkin, so when I was thinking of my cookies, I was thinking, dark and spooky night! The contrast of a blood red moon against the shadows. How can you tell I'm an English major? But, I am also part zombie. I had to do something else, so I decided to do Brains as well! 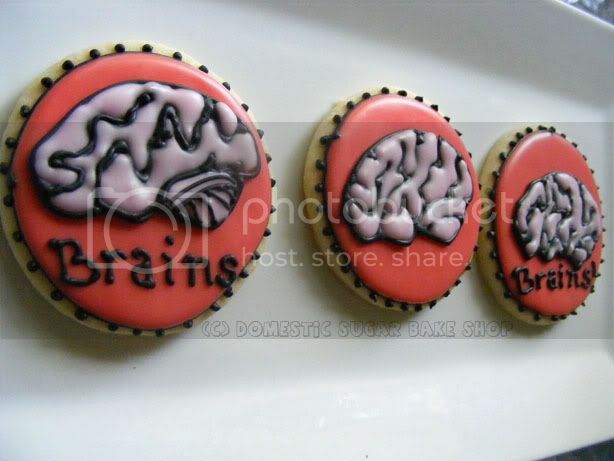 I actually wrote Brains because I was afraid no one would know what they were. It was a second guess, but I think they look rather sweet! This year, I can't be my usual Zombie self, so I get to play with a new costume... any guesses? I'll save that until Halloween! I'd love to know what you all plan on being! This time of year certainly is awesome. There is so much beauty, so much clean, fresh air. I love that I can open my windows and let the cool breeze in! Not only that, but it is the haunting season! OH! WHAT FUN! This year, our school is throwing a primary party, and the kids are going to do centers in costumes: I get to do the Drama/Singing center! YAY! I love seeing all the kids in their gear! I am super excited. Only 8 more days! 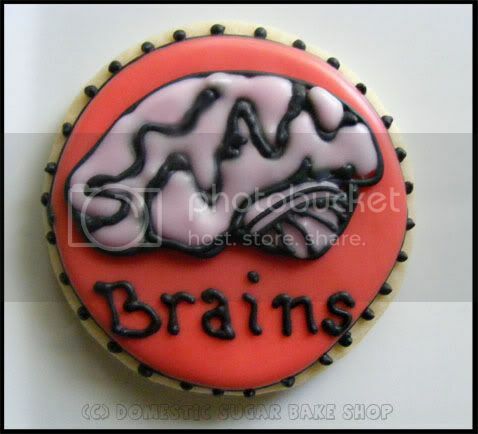 the brains turned out great - your piping on the webs is AWESOME! I love the colours and the lace like piping. Beautiful cookies! Those webs are super cool! Love the design. 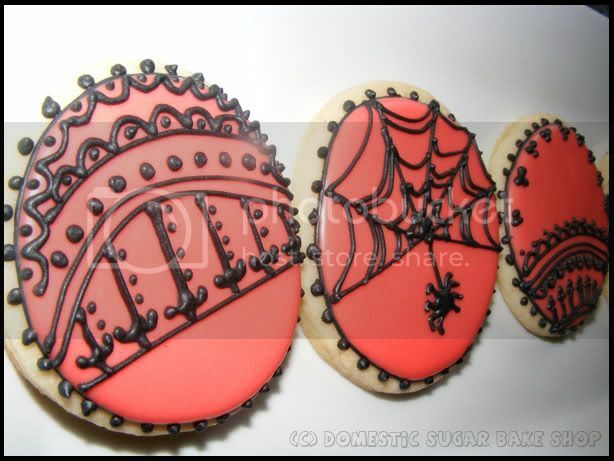 So original compared to other web cookies that I have seen out there! Awesome cookies!! You did such a great job decorating them.